Oh man, guys. Do you remember when I said I'd try to blog three times a week? I'm a TOTAL liar. My pants? They might possibly be on fire. For those of you who are curious, Beth, the fashion designer, recommended the book New Complete Guide to Sewing by Reader's Digest. Apparently most fashion programs in Philly use this book as a text. That's a good enough rec for me and I plan to buy a copy sometime. I also bought a fat quarters of fabric, but I have no current plans for them. If I manage not to screw up completely, I've got one or two ideas, though. Now, what is this post all about? I'd thought I'd talk about my knitting history and update you guys on my projects. 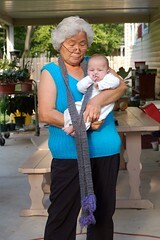 It turns out that I think I've managed to convert my cousin Talena (the sweetest person on Earth) into a knitter. Since I plan to hang with her once a week now, that means I have a knitting friend! We got together last week and she worked on a really cute scarf made from Lion Brand's Nature's Choice Organic Yarn in a simple two by two rib. I have a feeling that it is going to be her first wearable finished project as she had previously tried to make two stockinette scarves, which you all know just curls and doesn't look nice, out of acrylic yarn. My bad, as I apparently totally did not warn her about that, nor did I teach her to cast off, nor have I explained how to weave in ends. I'm going over next week with tapestry needles and I'm going to show her how to weave in some ends. Luckily, I also got to work on my own anklets a bit since they're simple stockinette and can be chucked to the side every time Nathan decides to put up a major fuss. I've also been working on Helen's socks quite a bit. Since they're knee high socks, they are slow going, but I'm finally working on the heel flap of the first sock. It's been so long since I've done a heel flap as opposed to a short row heel that I'm kind of intimidated. I've done it before, though, and I can do it again. I did temporarily take them off the needles when I got to the flap to make sure they fit my leg. They looked decent, but my legs are kind of fat (honestly a lot of that is calf muscle) so I'm hoping they look better on Helen. The pattern is gorgeous. So, what's this about the ghost of projects past? Do you see those? Those are three of my first projects, folks! The bottom one that Nathan is modeling up close and personal is my first ever projects. It's a basketweave scarf done for my mom. As no one warned me, I decided when first knitting to simply forge ahead and do a scarf of ten feet in length. As you can imagine, my knitting tension slowly started to relax from new tight knitter to relaxed looser knitter during the scarf's first three feet. When I examined my scarf, rather than just going with it when I realized this was happening, I tightened my knitting. This means that I made a scarf with a hourglass shape at one part of it. Yeah, that was smooth. Also, the scarf is acrylic and scratchy. Delightful! 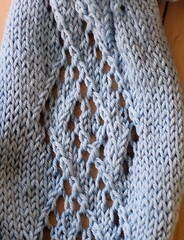 The second project is a lacey scarf in blue. Mmm, it was short, it curls, and I knew nothing about the wonders of blocking. It's itchy, too. I hate to look at this scarf though the picture does not make it look as horrible as it really is. The third is a horrible horrible horrible scarf done with a drop stitch and some fun fur on the ends. 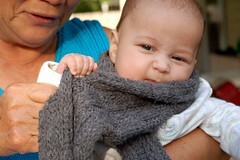 Oh man, that is one hideous scarf, and my mom likes it and wears it. I try to pretend she isn't wearing it when I see it on her. I'm going to leave those projects as my projects past for now. Expect to see some a top and some older socks in the near future, folks!